Your brain is hardwired to overthink. Why did that stranger bump into me like that? Was that a pickpocket trick? Wait, where’s my phone?! Times like these sour the mood and wreck your travels, so where do you go from there? Simple, you address the elephant in the room. Reintroducing the RiutBag, a revolutionary backpack that marries security with style and puts your relentless worrying at bay. 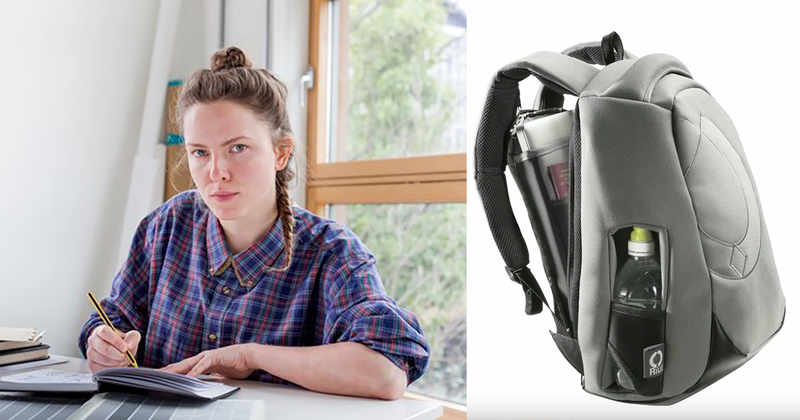 Back on October, we featured RiutBag and its creator, Sarah Giblin. Not only was the bag crowdfunded twice and backed with over 2,500 supporters on Kickstarter; but Sarah also went on to become a crowdfunded entrepreneur with a breakeven business in under 20 months. Today, we’ll be taking a deeper look into the bag, giving you a taste on what to expect. This rucksack is not your average bag. If you recall from our previous posts, one of its highlights is its simple yet innovative concept – namely, the hidden zips. With the zips located against your back, it shields the contents in your bag from the people walking or standing behind you – no one is able to access it, but you, the bag owner. 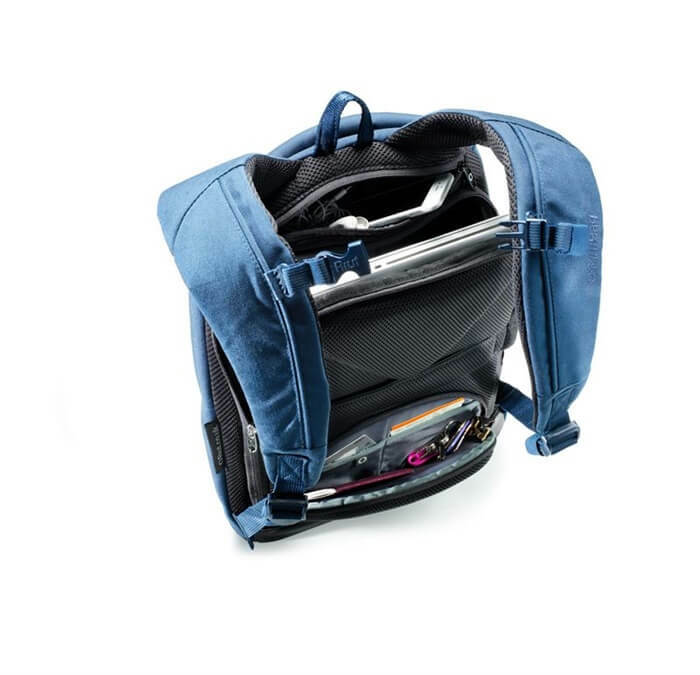 While not designed to carry laptops, the RiutBag Go (available in metro blue and shuttle green) is nonetheless able to withstand some weight – a quick look at the product description shows it has a 12-litre packing capacity. Made of supremely great material, the shoulder straps are exceptionally comfortable – which is a huge plus point for people with sensitive shoulders. All in all, the RiutBag Go is a great bag for school, work, or a spontaneous festival trip. The newer versions, RiutBag R10 and R15 (available in navy blue and black), are even more impressive. 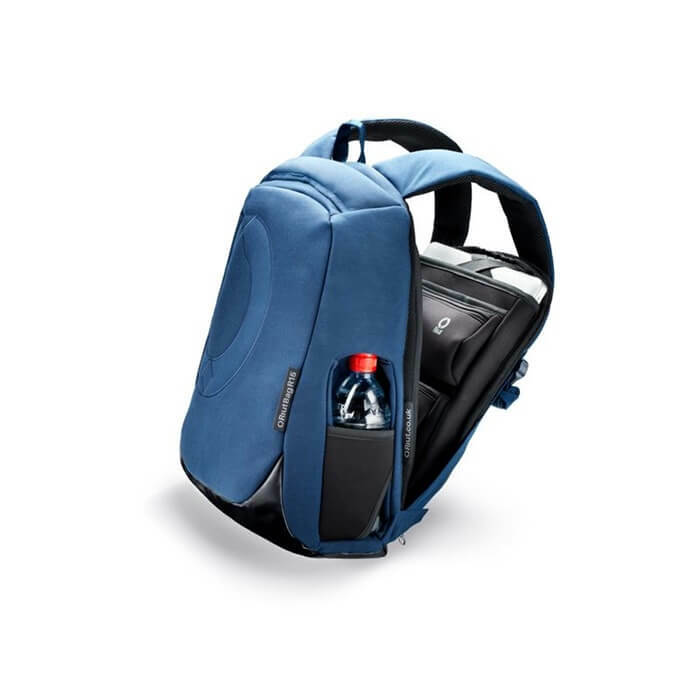 Its upgraded features like the water bottle holders is a clever use of space. The trolley suitcase strap is another winner. 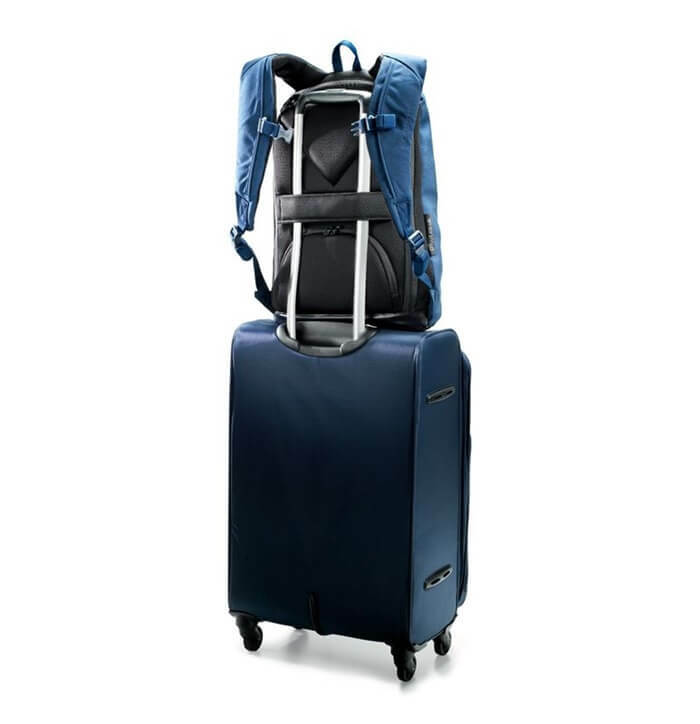 It allows you to slip the bag onto the suitcase handle, lightening your load and saving you the hassle from lugging multiple bags at one go. 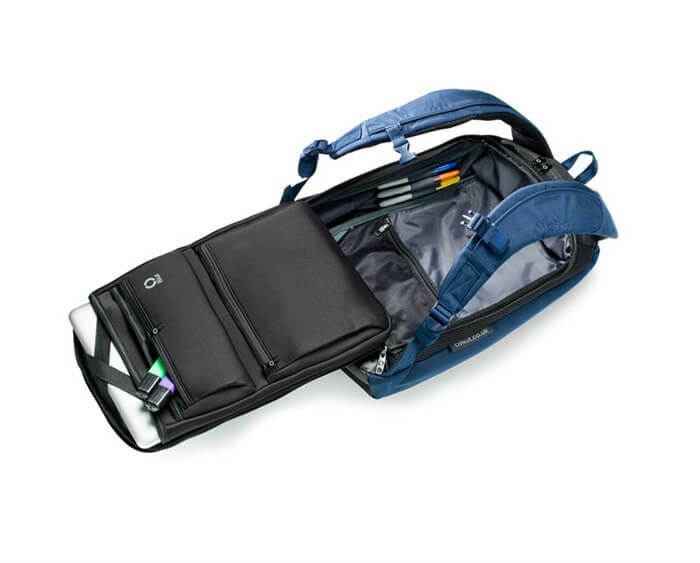 Its handy compartments like the D-pocket allows you to access your belongings without removing the bag against your back. This means that you no longer have to fumble around searching for your keys every time you try to open the door. The removable and re-attachable chest straps further raise the level by fitting the bag to your body shape. If having your bag straps sliding down your shoulders is a pet peeve, this is a huge perk to have. The R10 and R15 also make wonderful travel bags, and globetrotters and digital nomads (that’s right, there’s also a laptop compartment! ), will be tickled pink. 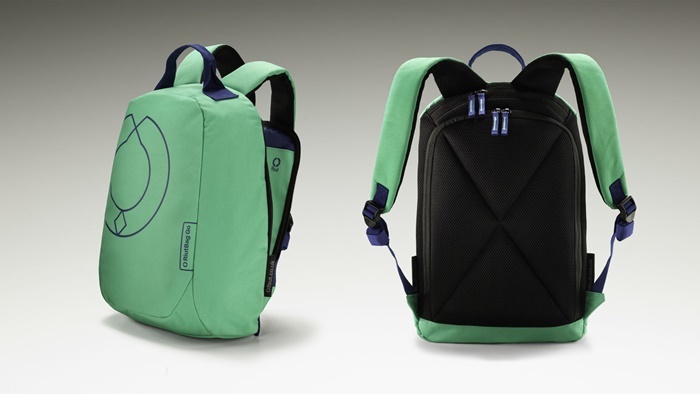 Ever since its launch, RiutBag Go has solidified its status as the coolest backpack on the block. The rave reviews on Digital Trends and Trusted Reviews only planted that crown more tightly on its head. Admittedly, the price is a wee bit steep for the newer versions, but given the bags’ functionality and quality, it could very well be an investment well worth making. Five years ago, Hollywood star Melissa McCarthy shared an embarrassing wardrobe malfunction story on Ellen that had the audience in stitches. She was carrying too many bags that pulled her clothes down to her kneecaps, revealing her flesh-coloured spanx in front of a group of construction workers. Had McCarthy carried a RiutBag at that time, things would had gone down differently. That reason aside, if you’re constantly plagued by personal safety issues, the RiutBag could be your next best solution. With secure storage and it being handmade to a standard of perfection, this rucksack shows how even the little things can make big things happen. This article was written in collaboration with the team at RiutBag.